Four-flowered yellow loosestrife (Lysimachia quadriflora) is a slender, non-woody, flowering plant. It is common in moist and wet prairies across eastern North America. In Minnesota it is found throughout the state except for the Arrowhead region. When not in flower, the foliage of four-flowered yellow loosestrife is easily overlooked among the taller prairie grasses. The stem is slender and the opposite leaves are narrow, up to 3½″ long but no more than ¼″ wide. The flower arrangement often appears as a whorl of four flowers, each one pointing in a different direction and nodding at the end of a slender stalk. In late summer the flowers are replaced by a shiny, globe-shaped, seed capsule with a long sharp spine at the tip. The capsule ripens in the fall. Four-flowered yellow loosestrife is identified by the narrow leaves, nodding yellow flowers, and globe-shaped fruit capsule. 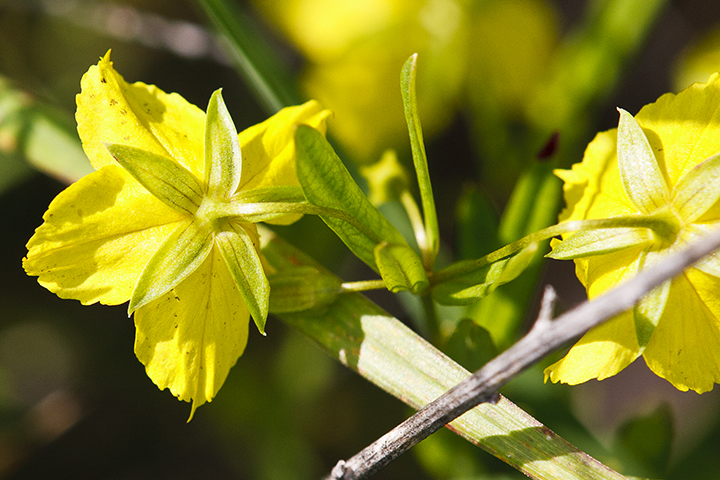 When in flower, it is similar in appearance to fringed loosestrife (Lysimachia ciliata) and whorled loosestrife (Lysimachia quadrifolia). Both of those species have much wider leaves. This entry was posted in Plants and tagged four-flowered yellow loosestrife, Lysimachia quadriflora on September 29, 2016 by John Valo. Bright Cobblestone Lichen (Acarospora socialis) is very common in southwestern United States. 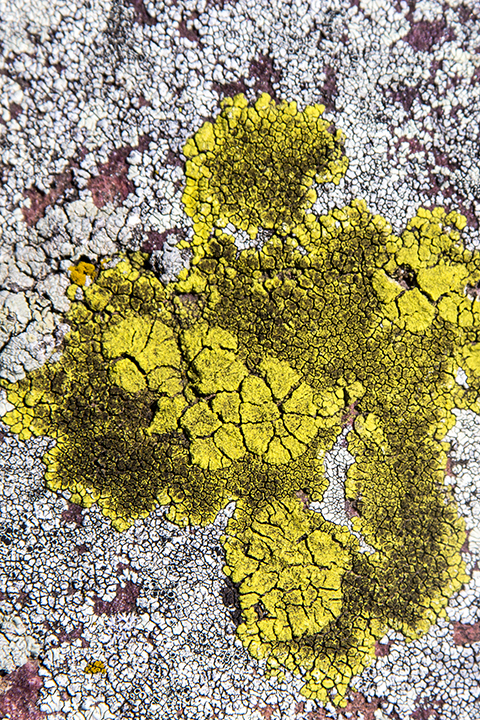 It is the most common yellow member of its genus in the southwest, and one of the most common lichens of any kind in the deserts of Arizona and southern California. It is uncommon in Minnesota, where it has been recorded only in Cottonwood County. Bright Cobblestone Lichen is up to 4″ wide and may be crusty, appearing sprayed on like paint; leaf-like, with thin, flat, lobes; or cracked, appearing somewhat like cracked paint. The upper surface is usually bright yellow or greenish-yellow when fresh but may be bleached white with age. This entry was posted in Fungi and tagged Acarospora socialis, Bright Cobblestone Lichen on September 15, 2016 by John Valo. 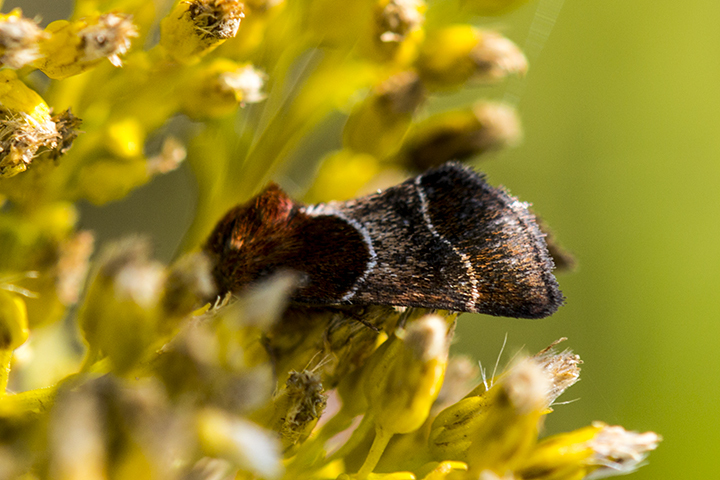 Arcigera flower moth (Schinia arcigera) is common and widespread across North America from the east coast to the Rocky Mountains. In Minnesota, it is found from late July to mid-September in fields with asters. It is active at night and is attracted to light, but can be also found taking nectar on flowers during the day. This is a small owlet moth. The adult is about ½″ long and has a wingspan of ⅞″ to 1″. It is distinguished from similar moths by dark brown and pale brown coloration, and by a white, smoothly curved, broadly S-shaped postmedial line. This entry was posted in Insects and tagged arcigera flower moth, Schinia arcigera on September 14, 2016 by John Valo. Leif Mountain is a The Nature Conservancy preserve in Kandiyohi County. Its 801 acres protect a diverse mix of habitats including wet, mesic, and dry prairies, oak forest, cattail marsh, and three lakes. There are three parking areas on Leif Mountain (see map above) giving access to three very different areas, and visitors should consider exploring all three. The south parking area is on 47 acres that includes about 20 acres of wet and mesic prairie, a 1-acre pond and cattail marsh, and a 2-acre pond. The remainder of this section is cattail marsh. A narrow dry land bridge leads to a wooded peninsula jutting into the marsh south of Section Twelve Lake. Access from the south area to the rest of the preserve is blocked by the lake and by cattail marsh. The southwest parking area is on 27 acres. 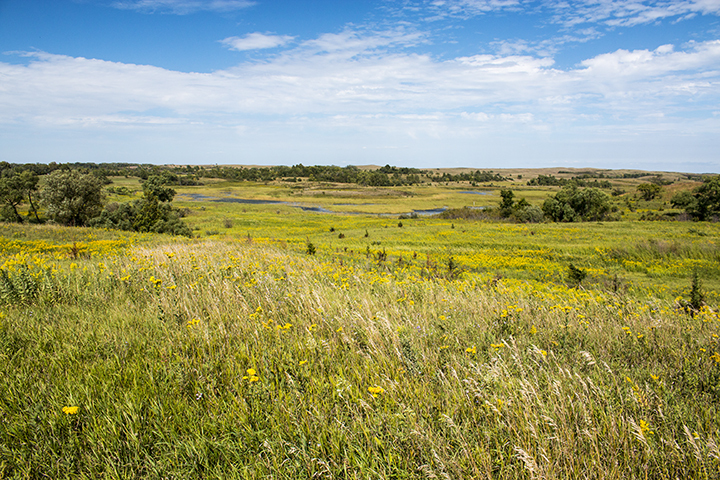 It includes two native plant communities, 2½ acres of Dry Sand – Gravel Prairie (Southern) and 1½ acres of Mesic Prairie (Southern), and 5 acres of mixed woodland and wet and mesic prairies. The remainder of the area is cattail marsh. The west parking area is on about 340 acres. It includes two unnamed lakes, 80 acres of Dry Sand – Gravel Prairie (Southern), 13½ acres of Basswood – Bur Oak – (Green Ash) Forest, and a mix of mesic prairie, wet prairie, and cattail marsh. The high quality forest has common and rare woodland species not found other places on the preserve. Several species with conservation status in Minnesota have been seen on Leif Mountain, including American White Pelican, Bald Eagle, Red-shouldered Hawk, regal fritillary, and American ginseng. This entry was posted in Nature Destinations and tagged Leif Mountain on September 13, 2016 by John Valo. 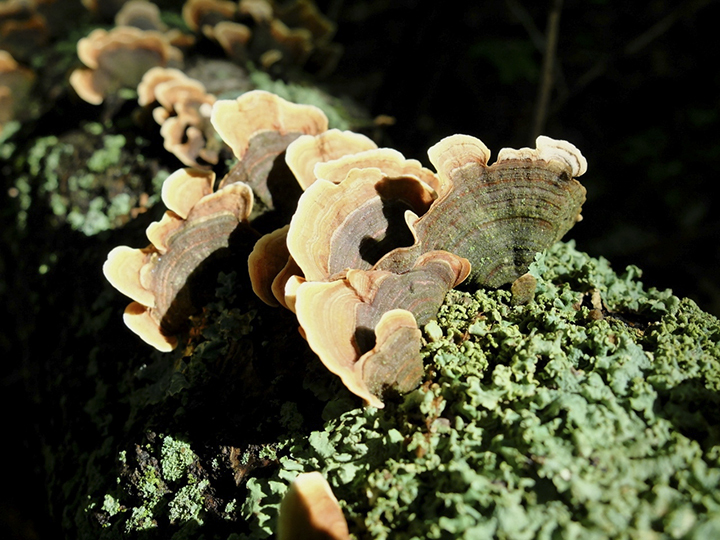 False Turkey Tail (Stereum ostrea) is an extremely common and widely distributed, wood decaying, bracket fungi. It is found on logs and stumps of dead hardwood trees, especially oaks. It appears as individual, overlapping, thin, semicircular or fan-shaped brackets. The upper surface is densely hairy and concentrically zoned dark reddish, orange, yellowish, brown, and buff. The under surface is smooth or slightly bumpy, with no layer of pores or tubes. Older caps are usually buff or gray above, gray or whitish below, and often greenish or blackish due to being partially covered with algae. False Turkey Tail can be easily mistaken for the more common Turkey Tail (Trametes versicolor). That species has brackets that often fuse into overlapping rosettes. The underside of the cap is covered with a layer of spore-bearing pores. This entry was posted in Fungi and tagged False Turkey Tail, Stereum ostrea on September 7, 2016 by John Valo.